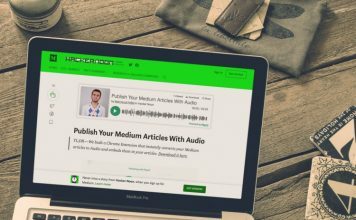 Medium, if you haven’t heard, is one of the largest online blogging platforms that houses independent writers and publishers alike. It has been in existence for over five years, but the revenue stream for writers has been next to nothing even after the launch of Medium Partner program earlier in 2017. While the company continues to build upon the first-ever attention-based payout system, you can adopt other monetization techniques to continue your writing journey on Medium. One such solution that has been made available to Medium writers is called Buyte, which allows you to accept donations from your dedicated reader base. 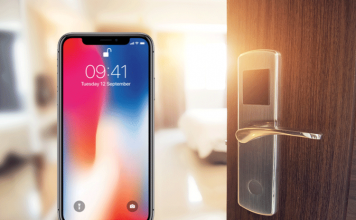 However, the highlight of this third-party mobile gateway is that it simplifies the process by employing Apple Pay as the primary mode of payment. So, this means you can now integrate an Apple Pay donate button into your post. 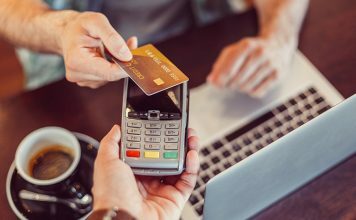 Developed by Australian developer Ryan Soury, Buyte is a mobile payments solution which aims to accelerate the checkout experience. The platform currently relies on Apple Pay to make it easier for more users to complete their purchase, adding value to your business. 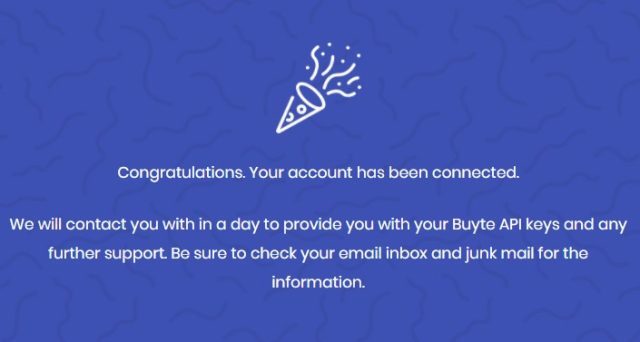 It only requires you to connect your activated Stripe account to Buyte and use their widget to collect payments on your website. 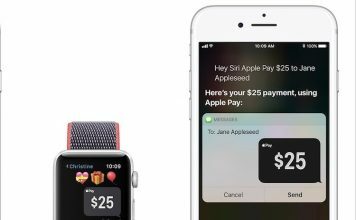 While the platform plans to serve as a fully-featured mobile payments solution, it hopes the simple Apple Pay embeddable widget has many use cases. One of them being the collection of donations via Medium posts, which the company is still trying to monetize and pay out its writers on the platform. 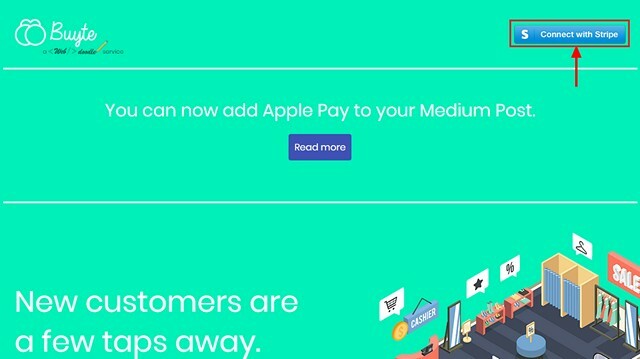 Soury further adds that you can copy the Apple Pay widget code from Buyte’s website and embed it on any website, then why not hand it over to Medium users to make it easier for them to support their writing. It will only act as stimulation for them to continue providing you with more intellectual and influential reads. 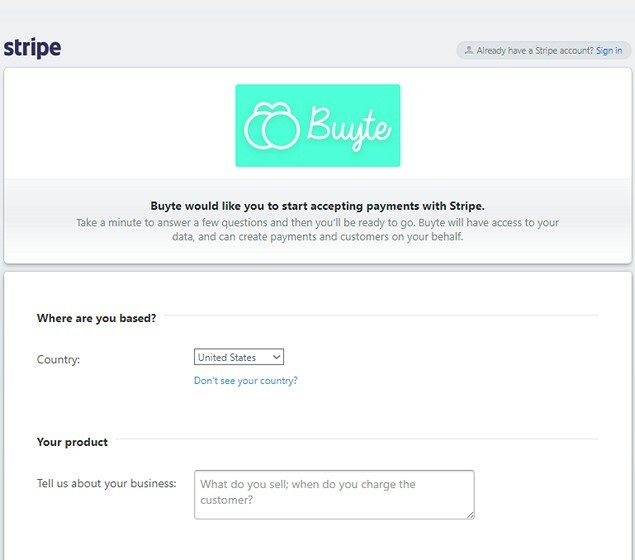 To start the process, we will first have to make a visit to Buyte’s official website to connect their payment gateway with Stripe (currently not available in India, coming soon). This will enable you to receive the donation in your Stripe account, which you can then transfer into your connected bank account. Navigate to Buyte’s website and click the ‘Connect with Stripe‘ button at the top right. You’re now transferred to the Stripe integration page, which requires you to enter your payment details to start accepting donations using Buyte. You need to fillout the form if you’re new to Stripe, else you can click the Sign in link at the top right to connect your existing account to the platform. I already have an existing Strype account, so I’ll just sign in to the same to authorize Buyte access to my payment details. 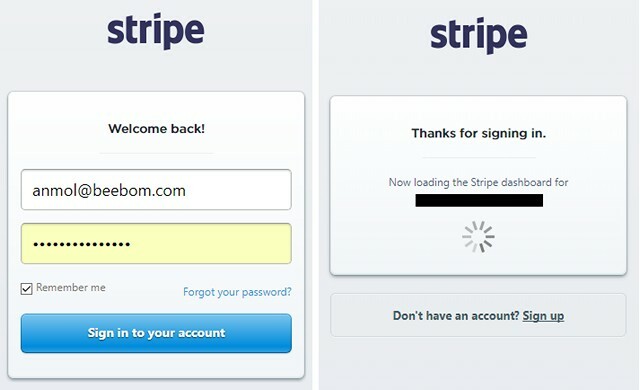 Once your Stripe account is successfully linked to Buyte, you will be redirected back to Buyte’s home page. Here, you’ll see a confirmation message telling you that it will take about a day to send API Keys via email. Now that you’ve received the API Keys, you can customize the Apple Pay widget that you’ll embed on Medium to start collecting donations. The process to generate a donation button may seem a little tricky at first but it’s actually quite simple. You just need to have your public key and these two lists (country code and currency code) handy to customize the widget as per your needs. Now, you need to replace the text between the angle brackets (< >) and the brackets as well with the values you want. Now, we’ve generated the Apple Pay widget link, so all that’s left to do is write the Medium post and paste the code anywhere in the body. Don’t worry, we will guide you step-by-step through this process as well. Open Medium.com and login into your account. Click on your profile picture on the top right and select the ‘New Story‘ option. This will open up the Markup editor, where you can scribble (read as type) your opinion or thoughts to share with the world. I decided to just write a test article, as seen under. Now, we need to embed the Buyte’s Apple Pay widget at the end of this paragraph. To do so, click on the plus icon and select the ‘Add an embed‘ option. 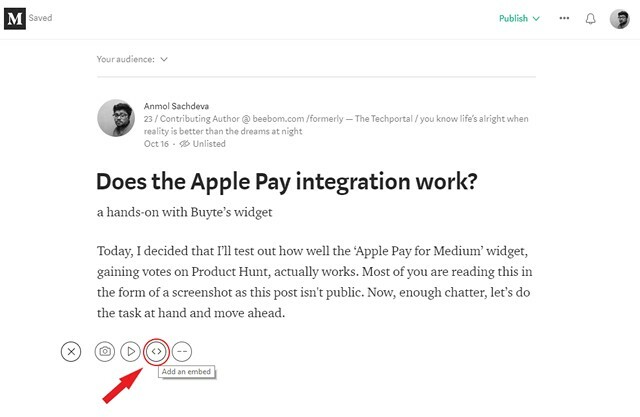 On selecting this option, the editor will ask you to paste the embed code into the article. You now just have to copy the code we generated earlier and paste it into Medium. The code that you pasted into your Medium post will appear as a link, confirming that you’ve generated it the right way. Now, press Enter to make the embed appear in the post. Voila, you’re almost there. 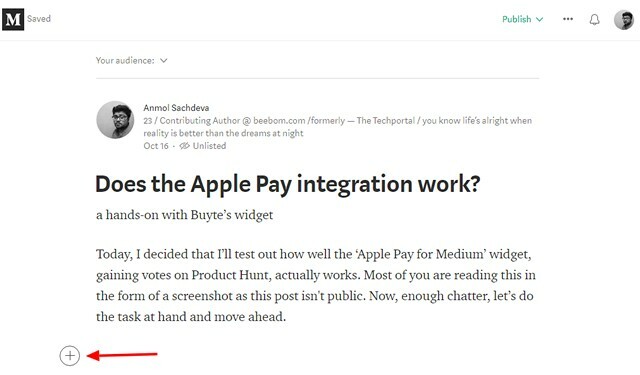 At the top right, click the Publish button to make your article with the Apple Pay donation button go live on Medium. Also, do remember to check that the Buyte integration is working as expected and there are no unforeseen errors, like an invalid country or currency code. 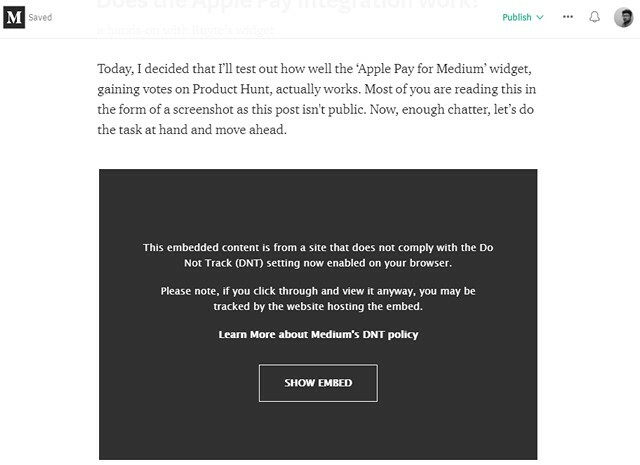 You can share your Medium posts, with the Apple Pay donation button, to monetize the content you produce for your dedicated reader base. If they’re satisfied with the quality of the same, they’ll surely support your endeavor. Good luck. 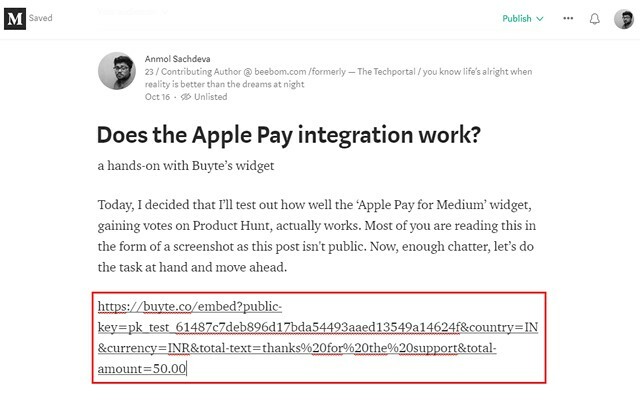 Note: If you’re reading a Medium post on your non-Apple device and would like to support the author, you can input your iPhone number in Buyte’s widget to receive a payment link. You can open the received link in Safari to make the donation through Apple Pay on your iPhone. 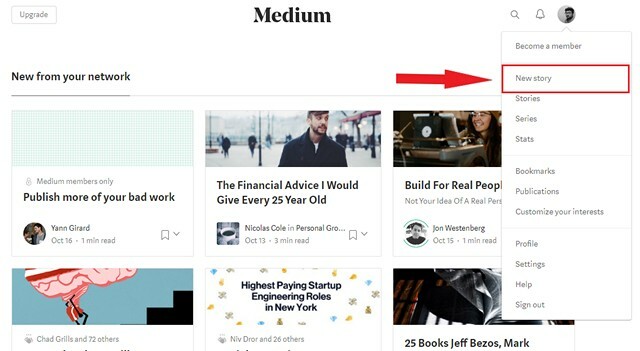 While Medium has recently rolled out its partner program for all of its publishers, who can get paid based on the attention they can capture on the blogging platform. Their payout is decided on the basis of the number of claps received from subscribed users, which may be extremely inconsistent. It is not possible for regular Medium writers to survive only on this payment, so alternatives like Buyte will surely come in handy. 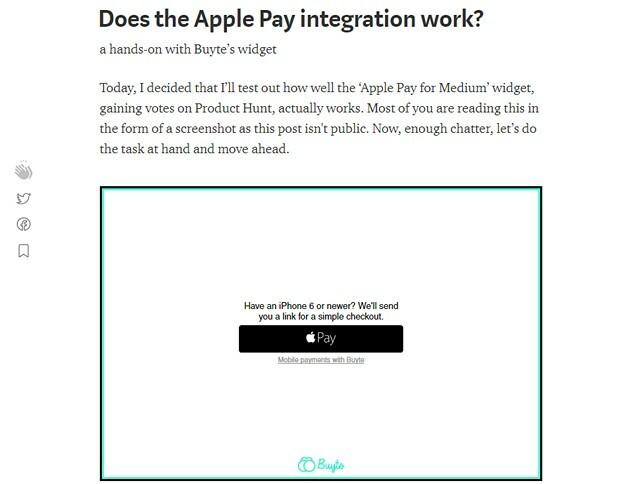 So, go ahead and integrate the Apple Pay donation widget into your articles to gain support from your true readers. If you have any other monetization alternatives for Medium, do let us know in the comments section below.